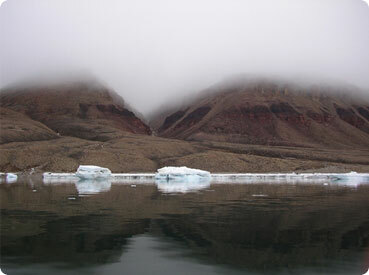 Between June 23 and August 8, 2008 the Inglefield Land Archaeology project will be conducting research at Cape Grinnell, on the northwest coast of Greenland. The team includes researchers and students from Bowdoin College, the University of California, Davis, the Greenland National Museum and Archives, Laval University, and the community of Qaanaaq. The project is funded by the National Science Foundation with additional support from the Greenland National Museum and Archives, the University of California, Davis, and Bowdoin College. Kangerlussuaq, Greenland, Eli Bossin, Kristina Sorg and Admiral Peary at Kangerlussuaq. June 24, 2008, Genevieve Lemoine. Eli Bossin, Bowdoin '09, and Kristina Sorg, Bowdoin '09, crossed paths in Kangerlussuaq, a settlement in West Greenland, on June 24th. Kristina was on her way back from Summit Camp on the Greenland Ice Cap, and Eli was traveling to Cape Grinnell. An Admiral Peary doll is accompanying Eli to Northwest Greenland where Admiral Peary did much of his work. Eli's audio posts will begin when he reaches Cape Grinnell and the field camp is established. This is Eli's first message from Cape Grinnell, detailing the events of the first week in Greenland. The message, which came via satellite phone, was cut off abruptly. In his second message from Northwest Greenland, Eli discusses the archaeological finds of the group and the weather conditions. The message ends in static after the satellite signal is lost. In this installment, Eli describes Cape Dorset hunting implements the group has found in the archaeological site and the new activities he is trying, including swimming in the Arctic Ocean and tasting muktuk (narwhal skin and blubber). Today Eli interviews Frédéric Dussalt, an archaeoentomologist from Laval University. Archaeoentomology is the study of insect remains found in soils in archaeological sites, which can provide information about the environmental conditions at the site when it was occupied. Archaeoentomologists collect live insects at archaeology sites for comparisons with the archaeological specimens. Eli also describes how he spent his first day off in Cape Grinnell. This installment sees the team finishing work on the Late Dorset site, making a trip to Force Bay, and dealing with cooling weather. Eli discusses how some team members are keeping busy when they are not working, and interviews Owen Mason, a geomorphologist from Anchorage, AK. As Owen explains, his job as a geomorphologist involves reconstructing the landscape history and development to gain valuable information on past climate conditions in the region. Eli gives an update on the progress of the investigation and the changes made to the team since the last message in this installment of the podcast. Dr. Genny LeMoine, curator of the Peary-MacMillan Arctic Museum and co-leader of the investigation, discusses the impact of the arctic environment on the preservation of the archaeological site, and describes the interior of a Thule house she is excavating. Today Eli interviews Joanne Goodsell, a graduate student at UC Davis, who discusses her work investigating animal remains at the archaeological site. Joanne is particularly interested in evidence of whaling, having found baleen in several of the houses they are excavating.The satellite signal breaks up and is then lost about three minutes into the message, therefore Joanne's interview is a little hard to follow. This morning Eli and the rest of the team were able to experience a full solar eclipse, as Northwest Greenland was one of the few places from which the eclipse was visible. The interview for this podcast is with Navarana Sørensen, of Qaanaaq, who is participating in an archaeological dig for the first time. Navarana is a translator and interpreter, and despite being a native of Northwest Greenland has never been to the Cape Grinnell area, making this a completely new experience for her. In what is probably the final audio post from Cape Grinnell, Eli describes the team's last weekend in Northwest Greenland, which included back-filling the archaeological site and being visited by an arctic wolf. Eli takes this opportunity to say thank you to everyone involved in the project, and express how much he has enjoyed his time in the arctic. The Peary-MacMillan Arctic Museum would like to thank Robert Denton, Senior Media and Design Consultant, for designing the template for the podcast and orchestrating the means by which it has been possible to post Eli's phone calls. We also appreciate Eli Bossin's (Bowdoin class of 2009) efforts to send us news from the field and Hillary Hooke's (Bowdoin class of 2009) willingness to summarize and post the Cape Grinnell messages. 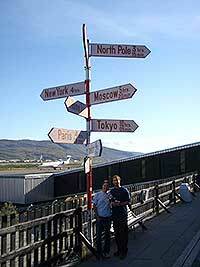 Eli calls from Thule Air Base in Northwest Greenland giving updates on the team's travel plans. Everyone is busy cleaning equipment and enjoying the comforts of the air base before tomorrow's flight to Baltimore. In closing Eli offers travel advice to his audience, telling us that if asked to go to Greenland, the only possible answer is 'yes'.